Through 20 years of experience in fields such as psychotherapy, coaching, consulting, education and project management, I’ve learned that the only way to feel content and fulfilled as a busy working parent is to manage your life as a whole. You can’t work on one tiny area of your life while ignoring the others and expect to feel fulfilled. Something will always be missing You’re a whole human being with a full and integrated life. Everything works together. Most of the time management tools and productivity hacks you’re obsessed with are really just distractions disguised as solutions. The truth is that burnout isn’t about time management at all. That’s just a symptom of a bigger problem. Here’s the reality: until you start to make conscious choices in all areas of your life, and follow through with consistent action over time, you’re going to stay stuck in overwhelm. Your exhaustion and stress will continue to build, and one day you’ll look back and realize you spent many of the most precious years of your life in survival mode. 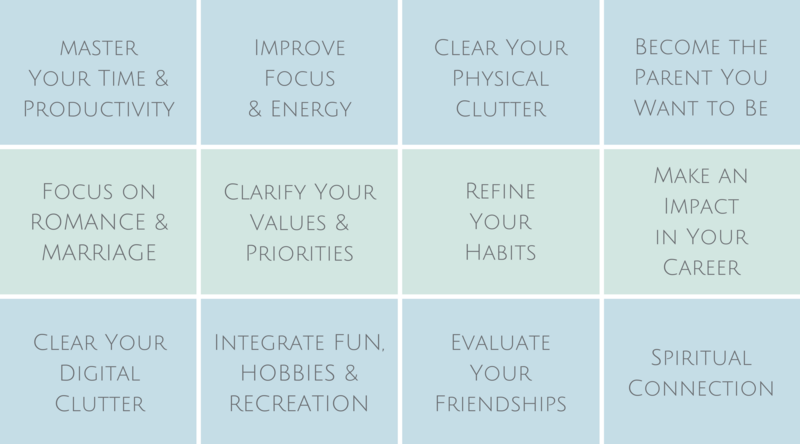 Each exercise allows you to focus on one specific area of your life and nail it. You’ll take stock of your life in that area only. You’ll shut out the rest (for the moment) and focus on building new skills and habits in that area of your life. You’ll clear out the clutter – mentally, emotionally and environmentally. You’ll simplify everywhere you can. You’ll become more engaged and present in everything you do. You’ll make small adjustments and improvements in a way that doesn’t feel overwhelming or burdensome. Just little tweaks that will add up over the days, weeks and months. In the end, you’ll become very delibrate in that area of your life before moving on to the next. Focusing on one thing at a time, in a deep way, will infuse your life with more control, freedom and peace… without having to sacrifice what’s most important to you along the way.